This article is about the subway system operating under Tokyo Metro Co., Ltd.. For the other subway system in Tokyo, see Toei Subway. For the whole subway network in Tokyo, see Tokyo subway. Tokyo Metro lines (Toei and JR lines are shown in faint colours). The Tokyo Metro Co., Ltd. (東京メトロ, Tōkyō Metoro), commonly known as Tokyo Metro, is a rapid transit system in Tokyo, Japan. While it is not the only rapid transit system operating in Tokyo, it has the higher ridership among the two subway operators: in 2014, the Tokyo Metro had an average daily ridership of 6.84 million passengers, while the other system, the Toei Subway, had 2.85 million average daily rides. The company replaced the Teito Rapid Transit Authority (帝都高速度交通営団, Teito Kōsokudo Kōtsū Eidan), commonly known as Eidan or TRTA, on April 1, 2004. Tokyo Metro is operated by Tokyo Metro Co., Ltd. (東京地下鉄株式会社, Tōkyō Chikatetsu Kabushiki-gaisha), a private company jointly owned by the Japanese government and the Tokyo metropolitan government. The company replaced the Teito Rapid Transit Authority (帝都高速度交通営団, Teito Kōsokudo Kōtsū Eidan), commonly known as Eidan or TRTA, on April 1, 2004. TRTA was administered by the Ministry of Land, Infrastructure and Transport, and jointly funded by the national and metropolitan governments. It was formed in 1941, although its oldest lines date back to 1927 with the opening of the Tokyo Underground Railway the same year. The other major subway operator is Tokyo Metropolitan Bureau of Transportation (Toei Subway) which is owned solely by the government of Tokyo. Tokyo Metro and Toei trains form completely separate networks. Prepaid rail passes can freely interchange between the two networks (as well as other rail companies in the area), but fares are assessed separately for legs on each of these systems and regular ticket holders must purchase a second ticket, or a special transfer ticket, to change from a Toei line to a Tokyo Metro line and vice versa. Though, most Tokyo Metro (and Toei) line offer through service to lines outside of central Tokyo run by other carriers, and this can somewhat complicate the ticketing. Many train stops are announced in both English and Japanese. Announcements also provide connecting line information. Ticket machines can switch between English and Japanese user interfaces. Train stations are signposted in English and Japanese (in kanji and hiragana). There are also numerous signs in Chinese (in simplified characters) and Korean. Train stations are now also consecutively numbered on each color-coded line, allowing even non-English speakers to be able to commute without necessarily knowing the name of the station. 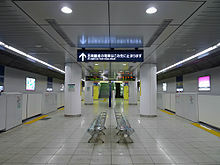 For example, Shinjuku Station on the Marunouchi Line is also signposted as M-08 with a red colored circle surrounding it; even if a commuter could not read the English or Japanese station names on signs or maps, they could simply look for the red line and then find the appropriately numbered station on said line. In addition, some trains have interior LCD displays which display station names in Japanese, English, Chinese, and Korean. Many stations are also designed to help blind people as railings often have Braille at their base, and raised yellow rubber guide strips are used on flooring throughout the network. Tokyo Metro stations began accepting contactless (RFID) Pasmo stored value cards in March 2007 to pay fares, and the JR East Suica system is also universally accepted. Both these passes also can be used on surrounding rail systems throughout the area and many rail lines in other areas of Japan. Due to the complexity of the fare systems in Japan, most riders converted to these cards very quickly even though there is an additional charge to issue it. The Tokyo Metro is extremely punctual and has regular trains arriving less than five minutes apart most of the day and night. However, it does not run 24 hours a day. While through service with other companies complicates this somewhat, the last train generally starts at midnight and completes its service by 01:00, and the first train generally starts at 05:00. Tokyo Metro indicated in its public share offering that it would cease line construction once the Fukutoshin Line was completed. That line was completed in March 2013 with the opening of the connection with the Tōkyū Tōyoko Line at Shibuya Station, allowing through service as far as Motomachi-Chūkagai Station in Yokohama. There are several lines such as the Hanzōmon Line that still have extensions in their official plans, and in the past, these plans have tended to happen, though often over several decades. There are also some other rail project proposals in Tokyo which would involve large-scale tunneling projects, but these are unlikely to involve Tokyo Metro. The only proposal that has any suggestion of possible Tokyo Metro involvement is the prominent project proposed as a new Narita and Haneda Airport connection through a tunnel through central Tokyo to a new station adjacent to the existing Tokyo Station. This line is often described as a bypass of the current Toei Asakusa Line. It would link the Keisei Oshiage Line (with service to Narita Airport) to the Keikyu Main Line (with service to Haneda Airport) through Tokyo Station. The 400 billion yen project would be largely divided between the Tokyo metropolitan government and the Japanese central government (which is similar to the structure of Tokyo Metro) with the rail operator or operators paying the balance. The suggestion of Tokyo Metro involvement comes mostly from its description as a bypass to the Asakusa Line which might imply it to be a subway line, but the principle proposal only includes one stop in Tokyo (at Tokyo Station). The principle justification of the proposal is to reduce connection time from Narita Airport to Tokyo Station by 13 minutes, and the design of the proposal makes this much more a high-speed rail project than a subway project (though, it would likely not be up to all of Japan's Shinkansen high-speed rail standards). Currently the only high-speed connection to the Narita Airport is the Keisei Skyliner which runs to Ueno, but there is ordinary train service between these airports using the Asakusa Line. The proposal would essentially allow the Skyliner to run to the more important Tokyo Station as well as establish a high-speed connection to the Haneda Airport. Tokyo Metro also owns a number of commercial developments which mostly consist of shopping developments at major stations. It also owns the Subway Museum near Nishi-Kasai Station on the Tokyo Metro Tōzai Line which opened on July 12, 1986 and features a few retired trains which once operated on the Ginza and Marunouchi Lines as well as a maintenance vehicle. Pasmo and Suica are accepted on the Tokyo Metro, as well as on railway stations operated by other companies. Transfers between Tokyo Metro subway lines and Toei Subway lines are usually not free, but a discount is given when using the Pasmo or Suica cards to transfer between lines. According to the company, an average of 6.33 million people used the company's nine subway routes each day in 2009. The company made a profit of ¥63.5 billion in 2009. Altogether, the Tokyo Metro is made up of nine lines operating on 195.1 kilometers (121.2 mi) of route. A Note: Excluding the 8.3 km stretch between Wakoshi and Kotake-mukaihara shared with Yurakucho Line. Namboku Line shares tracks of the section from Meguro to Shirokane-Takanawa with Toei Mita Line, 2.3 km. There are a total of 179 "unique" stations (i.e., counting stations served by multiple lines only once) on the Tokyo Metro network. Most stations are located within the 23 special wards and fall inside the Yamanote Line rail loop — some wards such as Setagaya and Ōta have no stations (or only a limited number of stations), as rail service in these areas has historically been provided by the Toei Subway or any of the various major private railways (大手私鉄). As of 1 April 2016[update], Tokyo Metro operates a fleet of 2,728 electric multiple unit (EMU) vehicles, the largest fleet for a private railway operator in Japan. Trains from other operators are also used on Tokyo Metro lines as a consequence of inter-running services. As is common with rail transport in Tokyo, Tokyo Metro trains are severely crowded during peak periods. During the morning peak period, platform attendants (oshiya) are sometimes needed to push riders and their belongings into train cars so that the doors can close. On some Tokyo Metro lines, the first or last car of a train is reserved for women during peak hours. ^ a b c d e f g h "Business Contents - Transportation Services - Business Situation". Tokyo Metro Co., Ltd. Retrieved 2014-06-07. ^ a b 営業状況 [Business Conditions] (in Japanese). 東京地下鉄株式会社 [Tokyo Metro Co., Ltd.] Retrieved 2015-11-24. ^ 東京都交通局ホーム - 経営情報 - 交通局の概要 - 都営地下鉄 [Tokyo Metropolitan Bureau of Transportation Home - Management Information - Overview of the Department of Transportation - Toei Subway] (in Japanese). 東京都交通局 [Tokyo Metropolitan Bureau of Transportation]. Retrieved 2015-11-24. ^ Martin, Alex (August 3, 2010). "Ubiquitous Tokyo subways moving the daily masses". The Japan Times. p. 3. ^ 各駅の乗降人員ランキング [Table of Traffic Performance by Station] (in Japanese). 東京地下鉄株式会社 [Tokyo Metro Co., Ltd.] Retrieved 2014-06-07. ^ 私鉄車両編成表 2016 [Private Railway Rolling Stock Formations - 2016] (in Japanese). Japan: Kotsu Shimbunsha. 25 July 2016. p. 213. ISBN 978-4-330-70116-5. ^ 東京メトロ13000系・東武70000系"日比谷線直通"新型車両の仕様が明らかに! [Tokyo Metro 13000 series and Tobu 70000 series - Details of new trains for Hibiya Line through services announced]. Mynavi News (in Japanese). Japan: Mynavi Corporation. 17 June 2015. Retrieved 17 June 2015. Wikimedia Commons has media related to Tokyo Metro. This page was last edited on 7 April 2019, at 18:52 (UTC).